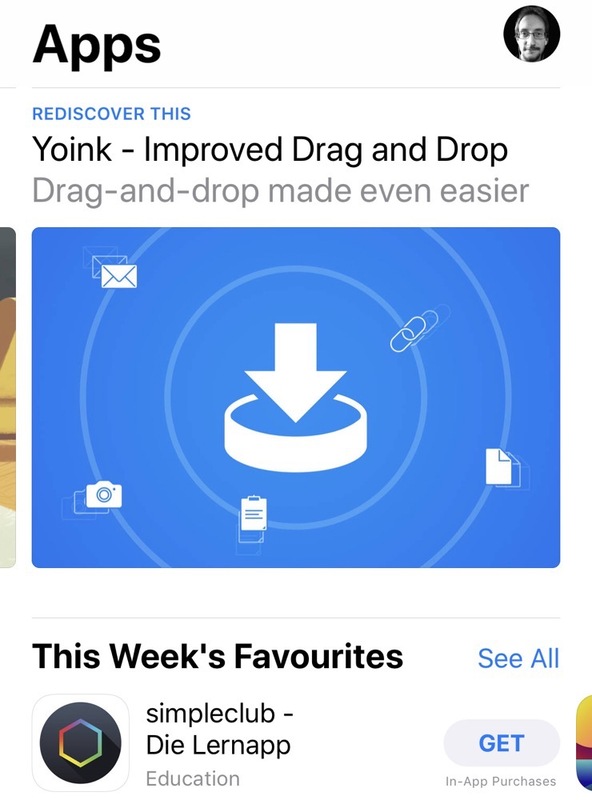 I’m very happy to report that Yoink for iPad and iPhone is currently featured on the App Store! I have to say, I’m quite filled with joy about that. To mark the occasion, I’m spontaneously holding a sale of both Yoink for iPad and iPhone, and Yoink for Mac for a limited time. Yoink for iOS is about 35% off right now, dropping from $5.99 to $3.99. You can purchase it here, and learn more about it here. Yoink for Mac is about 22% off right now, dropping from $7.99 to $5.99. You can purchase it here, learn more about it here, or directly download a free, 15-day trial here. In closing, I’d like to thank you all for your continued feedback on the app, making it better with every mail, tweet and review you send. I appreciate it immensely. Oskar is an independent Mac developer who is committed to enhancing the Mac experience. Since founding Cindori, he has designed, developed and released several popular apps such as Trim Enabler, Disk Sensei and VR Desktop. Disk Sensei helps you monitor and analyze your Mac’s drives, enhance your Mac’s performance and clean your system safely and efficiently. “Disk Sensei is all about optimizing your Mac performance, so I knew I wanted a way to let users find and delete large old files. After settling on the idea to build a sunburst chart to visualize the file system hierarchy, I struggled for a long time to build something that was responsive, performant and beautiful. “Disk Sensei offers features that are related to both hardware and software. In some cases, this means that the user must select the storage drive for which he wants to display data or perform actions on. For example, the Health feature, which displays diagnostic data and predicts the remaining lifetime of your hard drive or SSD. To avoid having to select a storage drive over and over when switching between features in the app, I opted for a global option and put a drive selection button right in the menu bar of the application window. It broke the conventions of the menu by having the button look like it’s supposed to behave like a menu option. It created even further confusion by being accessible while using features that wasn’t related to the currently selected drive. As if that wasn’t enough, the button was just too small to fit the full drive name, creating cryptic titles such as “APPLE”. Show and Tell presents developers’ and designers’ most and least favorite elements of UI/UX in an app they helped create or design. If you’d like to share, submissions are open! Submit your app here! In this new series on this blog, I’d like to give developers and designers a place to show off one UI / UX element they’re particularly proud of, and one they particularly dislike, in an app they worked on. If you’re a developer or designer and would love to share a UI/UX element in your app you particularly like, and one you particularly dislike, please mail me! Submissions will be published on no particular schedule in no particular order on this blog. You’ll be notified beforehand with a preview. Submissions will (or will not) be published at my own discretion. I’m looking forward to your submissions! For updates, please follow this blog, or @showandtell_ui on twitter.